Debbie and Pete are both turning 40, and both are having a bit of a hard time in life – trouble with their businesses, trouble with the kids, troubles with their dads, and trouble with their relationship. Debbie is difficult to please at the best of times, so has a hard time accepting turning 40. Pete has a better handle on it, but his birthday party is a disaster when some of their troubles come to the surface. Debbie’s quest to fix their lives has to be abandoned, but will they survive as a couple, and as a family? Debbie and Pete and their kids are, of course, the characters from Knocked Up which is one of my favourite movies. 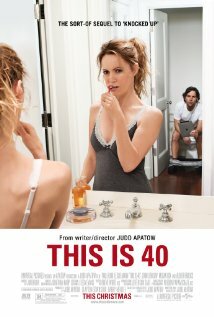 After watching the trailers for This is 40, I waited with baited breath to finally see this Apatow flick. But what went wrong? It has Jason Segal, it has Paul Rudd, it has Megan Fox semi-naked! It wasn’t as good as I expected it to be and I was a little disappointed. 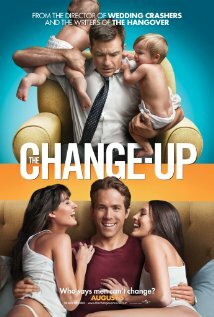 For some reason the film didn’t come together as expertly as it should have with Apatow’s guidance and so many good actors. However, there were still quite a few funny moments and I had did manage to have a few laughs. One saving grace was Melissa McCathy (Bridesmaids) in a very funny scene with Pete and Debbie in the principal’s office. In the end, I couldn’t listen to any more of Pete and Debbie fighting – it became tiring. I would like to give this film another watch to see if it gets better, but for now it sits on the shelf with those films that are particularly mediocre. Dave and Mitch are best friends. Dave is a career man, married with young children. Mitch is a would-be actor and lothario. On one fateful night they wish for each other’s lives while peeing in a fountain together. They wake up in each other’s bodies and have to lead each other’s lives. They are freaked out at first, but then settle into it, and get to know more intimate things about each other. This is a common rom com theme – trading places. We’ve seen it before, but this film does quite a fresh job with it. There are a few cringe-worthy remarks about women, but generally there is quite a bit of light humour and laugh-out-loud moments. Worth a watch on Saturday night. Matthew Perry plays grown up Mike O’Donnell and Efron plays the teenage Mike. Poor old Mike, 16 years at the one company and still no promotion, wife kicks him out, kids ignore him…where to now? Maybe it shouldn’t have turned out like this. When he was 17 he made a decision that changed the course of his life. He wants to go back to that life, when it was better, and maybe he’d make different choices. So back he goes, he’s 17 again. The transformation theme does pop up a few times in the rom com world, and this one gets a thumbs up from me. I’m a huge fan of Leslie Mann, squeaky voice and all, and there’s also a great supporting role from Thomas Lennon who plays Mike’s best friend Ned. But nothing beats Zac Efron as the young Mike, who really does make you wish you were 17 again!